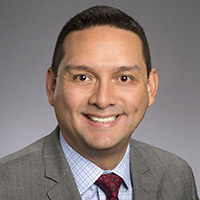 Kenneth Cardona, MD, FACS, is a board-certified surgeon and surgical oncologist who joined the Emory University faculty in 2012 after completing a Fellowship in Surgical Oncology at Memorial Sloan-Kettering Cancer Center in New York. Dr. Cardona has a clinical interest and expertise in the management of retroperitoneal/abdominal sarcomas as well as soft tissue sarcomas of the trunk and limbs. As a leader and active member of the Sarcoma Working Group at Emory University Hospital Midtown, he collaborates with soft tissue pathologists, medical and radiation oncologists, and interventional radiologists with expertise in the treatment of sarcomas to develop individualized treatment plans for each patient. Dr. Cardona leads national research efforts in the study of sarcoma as the principal investigator of the United States Sarcoma Collaborative. Internationally, he is an active member of the multi-institutional TransAtlantic Retroperitoneal Sarcoma Working Group and Desmoid Working Group. Additionally, he is on the editorial board of the soft tissue sarcoma section of Annals of Surgical Oncology, Journal of Surgical Oncology and Oncology. In addition, he has considerable experience in the treatment of gastric, liver, pancreas, and neuroendocrine malignancies where he is involved with the Gastrointestinal Oncology working group at Emory University Hospital Midtown. Dr. Cardona attended medical school at the Ponce School of Medicine and completed his internship and general surgery residency at Emory University School of Medicine. Dr. Cardona completed two fellowships, the first in transplant immunology at the Emory Transplant Center and the second in Surgical Oncology at Memorial Sloan-Kettering Cancer Center. Dr. Cardona's research interests are in clinical and outcomes investigations in patients with retroperitoneal and soft tissue sarcomas. He leads Winship Cancer Institute's Division of Surgical Oncology research efforts and as the principal investigator for the U.S. Sarcoma Collaborative he directs the sarcoma research efforts of the 8 academic centers involved in the collaborative. Additionally, as an active member of the TransAtlantic Retroperitoneal Sarcoma Working Group, a collaborative that involves sarcoma experts from over 40 centers across the world, he has been involved in numerous publications focusing on guidelines for management and treatment of patients with retroperitoneal sarcomas. Dr. Cardona has numerous publications in peer-reviewed journals and is on the editorial board of the soft tissue sarcoma section of various high-impact journals. Dr. Cardona has received numerous awards including the Young Scientist Award from the Immune Tolerance Network, the Award of Academic Excellence, and the Douglas Murray Academic Professionalism Award from the Department of Surgery of Emory University School of Medicine. Additionally, he was listed as one of Atlanta Magazine's "Top Doctors" in 2016 through 2018.